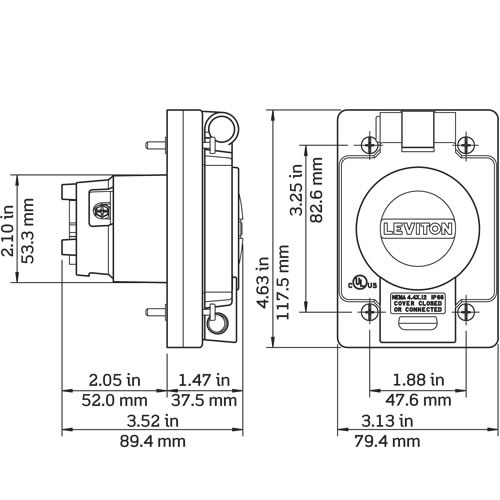 Leviton Wetguard® 2-Pole 3-Wire industrial grade corrosion-resistant locking inlet receptacle with cover, accommodates wire size of 16-10-AWG. It has a voltage rating of 125-Volts AC and current rating of 20-Amps. 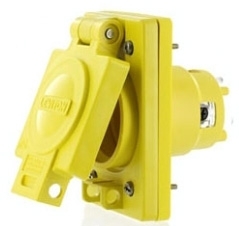 Screw mountable receptacle in yellow finish, has nickel coated brass blade and Valox PBT cover for added strength. It has nickel coated brass contacts. NEMA L5-20P configured grounding receptacle withstands a dielectric strength of 2000-Volts. It measures 2-27/32-Inch x 1-45/64-Inch x 4-9/16-Inch. Receptacle meets UL 498, CSA C22.2 No. 42, ANSI C-73, NOM 057 and NEMA WD-6 standards.